The Greatest is a 1977 film about the life of boxer Muhammad Ali, in which Ali plays himself. It was directed by Tom Gries and Monte Hellman. The film follows Ali's life from the 1960 Summer Olympics to his regaining the heavyweight crown from George Foreman in their famous "Rumble in the Jungle" fight in 1974. The footage of the boxing matches themselves are largely the actual footage from the time involved. 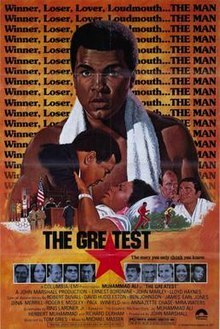 The film is based on the book The Greatest: My Own Story written by Muhammad Ali and Richard Durham and edited by Toni Morrison. The song "The Greatest Love of All" was written for this film by Michael Masser (music) and Linda Creed, (lyrics) and sung by George Benson; it was later covered by Whitney Houston. Rahman Ali, Howard Bingham, Harold Conrad, Don Dunphy, Lloyd Wells, Pat Patterson, and Gene Kilroy appear as themselves. There are many uncredited roles in the film including some major characters, such as Ruby Sanderson and his girlfriend, Belinda Board, who became his wife, and Herbert Mohammed, son of Elijah Muhammad, who was Ali's manager at one point. Lonette McKee was originally going to portray the role played by Annazette Chase. All music composed and produced by Michael Masser, and arranged by Masser and Lee Holdridge. Vincent Canby of The New York Times called the film "a charming curio of a sort Hollywood doesn't seem to make much anymore." Kevin Thomas of the Los Angeles Times called the film "potent pop biography, lively and entertaining, in which the irrepressible world's heavyweight boxing champion projects exactly the image he wants us to have." Gene Siskel of the Chicago Tribune gave the film 2.5 stars out of 4 and wrote, "As a diverting entertainment, 'The Greatest' is more than satisfactory." Arthur D. Murphy of Variety wrote that Ali brought the film "an authority and a presence that lift John Marshall's production above some of the limitations inherent in any film bio." David Badder of The Monthly Film Bulletin stated, "The Greatest delivers exactly what one would expect: a hagiographical account of Ali's best-known exploits, giving full rein to the inimitable, volatile personality but in the process applying liberal coats of whitewash." ^ a b Canby, Vincent (May 21, 1977). "The Greatest (1977) Ali's Latest Victory Is 'The Greatest'". The New York Times. ^ Lucas, Bob (11 November 1976). "Angry McKee Quits Greatest And Goes To Pryor Film". Jet. Retrieved 25 April 2016. ^ "People: June Allyson to wed; Gershwin home saved". Ottawa Citizen. 27 October 1976. Retrieved 25 April 2016. ^ Canby, Vincent (May 21, 1977). "Ali's Latest Victory Is 'The Greatest'". The New York Times. p. 13. ^ Thomas, Kevin (May 19, 1977). "Ali Piles Up Points in 'Greatest'". Los Angeles Times. Part IV, p. 14. ^ Siskel, Gene (May 23, 1977). "'The Greatest' isn't the greatest, but takes an entertaining jab at it". Chicago Tribune. Section 3, p. 9. ^ Murphy, Arthur D. (May 25, 1977). "Film Reviews: The Greatest". Variety. 21. ^ Badder, David (September 1977). "The Greatest". The Monthly Film Bulletin. 44 (524): 192. Screenplays by Ring Lardner Jr. This page was last edited on 26 January 2019, at 21:32 (UTC).